For some people it is natural to get into the thick of things and really get their metaphorical and even actual hands dirty a bit. These people want to get the job done and they don’t really care how hard they need to work in order to accomplish their goals. They aren’t willing to just observe the situation, instead they want to really dive in and take care of the job at and. 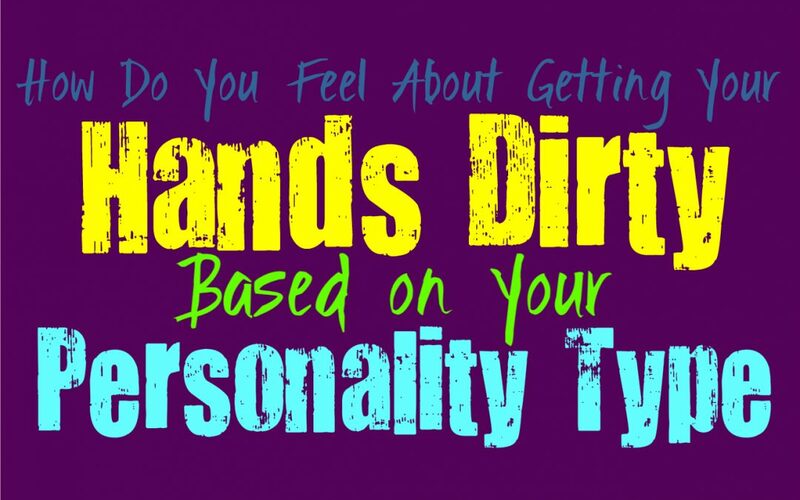 Here is how you feel about getting your hands dirty, based on your personality type. INFJs are often seen more as observers than active participants in most things, but that doesn’t mean they are incapable of getting their hands dirty. Sometimes it is just feels more rewarding for them to be the wallflower who observes and really learns from what they see. In some situations they will step in and get their hands dirty, since they aren’t of being the ones to take care of the harder work that needs to be done. INFJs do what is required of them most of the time, especially if they are doing it for the sake of someone they love deeply. ENFJs are definitely the type to really get their hands dirty, since they are all around hardworking people. When there is something that needs to be done, they will be more than willing to step in and take care of things. ENFJs also realize that sometimes they are the best person for the job, even if it is challenging and a bit messy in some ways. ENFJs can get their hands dirty both metaphorically and often physically, since they are rarely all that squeamish when there is something that requires their attention and skills. INFPs are often more likely to be observers in many situations, and they might actually dislike being the ones to get their hands dirty. They can actually become so caught up in their own thoughts that remaining focused on a task which requires them to really dive in, can be a bit unnerving for them. INFPs have rich imaginations and are often very sincere people, but sometimes this makes it more difficult for them to feel comfortable getting their hands dirty. They don’t just want to step into a situation without being sure it is something they want to do themselves. ENFPs are sometimes unpredictable people, who can be both comfortable getting their hands dirty and completely avoidant of it. For them it entirely depends on their mood and which thing they are leaning towards. In some situations the ENFP is the best person for the job and more than capable of diving in headfirst. There are other times where they simply don’t want to do something and lack the motivation to actually get their hands dirty and involved in what is required of them. INTJs are often very capable of getting their hands dirty, even though they don’t often want to do this. They are often observers who prefer to learn from a situation and do their best to get things done without always having to be directly involved. INTJs are capable of getting their hands dirty when the situation calls for it, especially since they prefer to do many things themselves. They are independent and efficient people who work hard to accomplish whatever goals they sincerely want to achieve. ENTJs are focused on efficiency and really getting things done, and so because of this they aren’t afraid of getting their hands dirty. While ENTJs are excellent at delegating to others, there are times when they know it is best for them to step in themselves. They want to get things done and ensure that the job is perfect, and so sometimes this requires their own skills and abilities. ENTJs will get their hands dirty if they feel like it is the best option to gain true efficiency and results. INTPs can sometimes be anxious about really getting their hands dirty, since they are sometimes hesitant about jumping into a situation. They believe in using their minds to learn as much as they can and really devise the most logical strategies. Sometimes INTPs can lack the motivation to really want to get their hands dirty, unless it is something they become truly passionate about. They are certainly capable of getting into the thick of things when they are excited about something and want to learn firsthand. ENTPs are constant observers of their surroundings and what is going on, but at the same time they enjoy participating. They sometimes enjoy getting their hands dirty since they can really learn from these experiences even more. ENTPs are all about growth and learning, and so they want to be able to open their minds to new things and opportunities. For the ENTP it is exciting to dive into the situation head first and really get their hands dirty trying to uncover the truth and information in front of them. ISTJs are definitely capable of getting their hands dirty, especially when something needs to be done efficiently. They aren’t afraid of having to step in and take care of business, even if it is a bit messy or difficult to others. For the ISTJ it is important to remain laser focused on what is important to them, especially when it comes to the workplace. They don’t like allowing a fear of stepping in to restrain them from fixing the problem themselves. ISTJs are more than capable of getting their hands dirty, and are willing to do the work others aren’t. ESTJs are very hardworking people who certainly aren’t afraid of getting their hands dirty if need be. They can really step into the thick of things in order to get things done efficiently and with a sense of pride. ESTJs don’t like standing back just allowing others to handle things, especially since they often feel like they can do it much better themselves. In situations where the job is important, the ESTJ will often want to step in and get their hands dirty themselves rather than allowing others to make mistakes. ISFJs aren’t afraid of getting their hands dirty, since they are practical people who take care of those around them. When there is something they need to get done the ISFJs does not want to disappoint their loved ones. For them it is important to be strong and capable individuals, even if the task at hand seems a little bit messy or challenging. For the ISFJ their priorities are in taking care of others and being someone who does what needs to be done no matter how difficult. ESFJs are often capable of getting their hands dirty metaphorically, especially with something that really needs to get done. They care about their loved ones and want to be sure they are taken care of both practically and emotionally. Sometimes ESFJs will see that the job isn’t being handled properly, and so they will step in themselves instead of delegating to someone else. Even if the ESFJ is in a position where they don’t really need to get their hands dirty, they aren’t afraid of doing so if they feel it is truly necessary. ISTPs definitely aren’t afraid of getting their hands dirty when they really need to, both metaphorically and physically. They can get into the thick of the situation and might even prefer this over simply observing what is going on. ISTPs are very connected to the world around them and they don’t like just sitting back watching others handle things and experience life. For the ISTP it is important to involve themselves in things they are excited about, and so they are certainly capable of getting their hands dirty. ESTPs really aren’t afraid of getting their hands dirty and can often handle tasks that most people are afraid of. They are focused on involving themselves instead of just sitting back watching others participate in life. ESTPs are risk-takers by nature, who truly enjoy being able to experience life and the thrills involved. For the ESTP it is important to take care of things themselves, especially if they feel like others simply aren’t capable of doing it quite as well as them. ISFPs aren’t afraid of getting their hands dirty when there is something they are excited or passionate about. They don’t necessarily feel a strong desire to involve themselves in every situation, only the ones they feel personally connected to. ISFPs are very connected to the physical world around them and so sometimes they enjoy get their hands dirty quite actually. For the ISFP it is important to participate in life and not just observe things from an outside perspective. ESFPs certainly aren’t afraid of getting their hands dirty, since the really prefer to participate in life. They dislike feeling stagnant or like they are simply observing those around them, since ESFPs really want to experience things. For them it is often rewarding to really get their hands dirty and jump into the thick of things, even if others are a bit afraid of doing so. For the ESFP the reward is often greater than the risk and so for them it can be thrilling to involve themselves in something new.